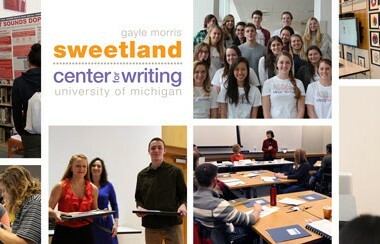 Last winter, Sweetland offered a new course directed at graduate students in the School of Education’s MAC program. 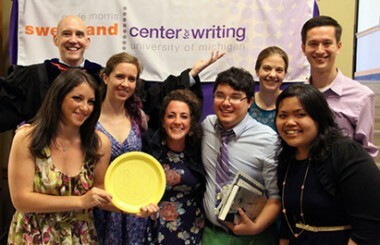 This intensive degree program awards students a Master of Arts in Educational Studies along with Secondary Teacher Certification in Michigan. Writing 430, “Teaching Writing,” satisfied a cognate requirement for the dozen students who enrolled. For the duration of the course, these students were also assuming more responsibilities in the various classrooms where they were completing their student teaching assignments. Writing 430 was piloted by Anne Gere and Tim Hedges, and this team-teaching approach led to an engaging and productive classroom dynamic in which students received a great deal of attention and feedback. Because students were involved in a variety of disciplines—biology, chemistry, history, math, and English—conversations about writing often developed in unexpected and informative ways. The class became an open forum for students (and instructors) to share the challenges they faced in their attempts to integrate writing into their curricula. Students engaged in a range of writing tasks designed to get them to think critically about audience and the various relationships they would develop as teachers. They wrote to students, parents, administrators, colleagues, and the general public. They maintained individual blogs and created an online community that allowed for the exchange of ideas beyond class time. The course also invited several area high school teachers to Skype with students as a way to share further strategies about productive pedagogical practices related to writing instruction. After the initial pilot run, the course has been revised, and it will be offered again in Winter 2014.